Sara i believe that it would be better if you put the books in order of time you bought them. It's a bit boring to put all the stuff in alphabetic order. So what do you think? I don't think I know the exact order anymore. If it's interesting, I can add a field that specifies when I acquired each book. I wouldn't have thought others would find this interesting, though. I've added a field that specifies since when a book got added to my library. The dates (month/year) should be roughly correct, and I managed to add them for all except one. I think I'll be able to add most dates for the booklets I have, too, but we'll see. Note, though, that some books were presents, rather than me buying them. hi sara, i was wonderin if u might be willing to write your own reviews for the books you got. it would really help alot of people i think including me. if you do write reviews for you books could you include the following: average paper size for the more complex models, 1-10 rating, average difficulty rating for the more complex models, are the diagrams cledar, and your own personal oppinon. i realize that this is probably alot to ask for, but it would really help. if you don't have the time or don't want to do it thats fine. In some ways I try to contribute to the origami community things that are not as accessible yet. That's why I did the dictionary, and that's why I next want to do a section on where to buy paper. Writing reviews is a bit lower on the list. I think I'd also find it hard to write honest reviews, because they're very subjective and I wouldn't want to rate a book less complimentary. My opinion on various books changes over time, too. It goes both ways, sometimes I find I enjoy a book much more than in the beginning, sometimes I don't like the designs presented as much anymore after a while. And it can change more than once. Ah, I don't know whether I want to go into it. 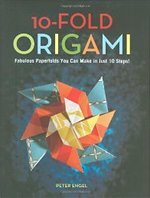 I´m suro gonna buy thi book, i don´t know nothig of origami but i wanna learn.